The year was 2004 and the summer was refusing to die. The autumn rains and winter gales had not materialised yet and the ground was still firm. All things looked good for the Rye Bonfire’s annual celebrations. On the Friday the local police force informed the Society that they had a slight problem as they were rather short of traffic cones to mark the route of the procession. Word went out to all members to collect up any odd lost or ‘easy to acquire’ road signs that they could lay their hands on. And it so happened that along a straight stretch of road near to my home, there were fifty-seven new cones lying in the grass alongside the highway. They were not in use and would not be required until Monday at least. They were begging to be put to good use over the weekend! On the Friday night my eldest daughter and her husband arrived home for the weekend to attend the carnival. That night, after catching up with all the news from my daughter, my family left the New Inn at Winchelsea to retire home. I saw a chance to initiate my newly acquired son in law to the bonfire and together we journeyed to the length of road to borrow traffic cones. Even with the back seats folded down there was still little room for no more than thirty four of the large new fluorescent cones and we could not shut the back door, but no matter, there was no traffic about at one twenty that night. The stars shone from a cold clear sky, promising a fine day tomorrow. For years now the huge procession on Bonfire Night had dwindled in the numbers of floats. There were to be only five as opposed to the sixties when up to twenty took part, always in the rear of the walking groups. 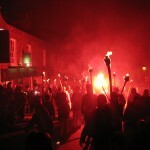 This year the floats were to spear point the head as it led around the town followed by one thousand blazing torches. The weather had been so mild and dry this year that an awful lot of trees still held their summer clothing of leaves awaiting the fall. “We’d better stop to let them pass.” But they had no intention of overtaking, instead stopped behind us. My son in law’s response was electric. “Quick! Get out before they do us for not wearing our seat belts.. He was well versed in being stopped by the police at this time of night in Nottingham, whereas I had never before been apprehended. He was well used to being slammed over the bonnet and frisked, then breathalysed, as all traffic was suspect late at night. Nothing like that happened to me on approaching the officer. I decided that honesty would be the best policy so told him I had only borrowed the cones for the weekend. He did not bat an eyelid, only saying that he knew where they had come from. The lying little bugger! He had no idea of where we had acquired them, he was more interested in the flapping door, informing us that it would not do, we had to take some of the cones out and shut the door properly. So stacking them up on the pavement we told him they were likely to be scattered across the road by the first drunk gang that came along. He had not thought of that and helped to tidy up the full car so getting nearly all of the cones back in. 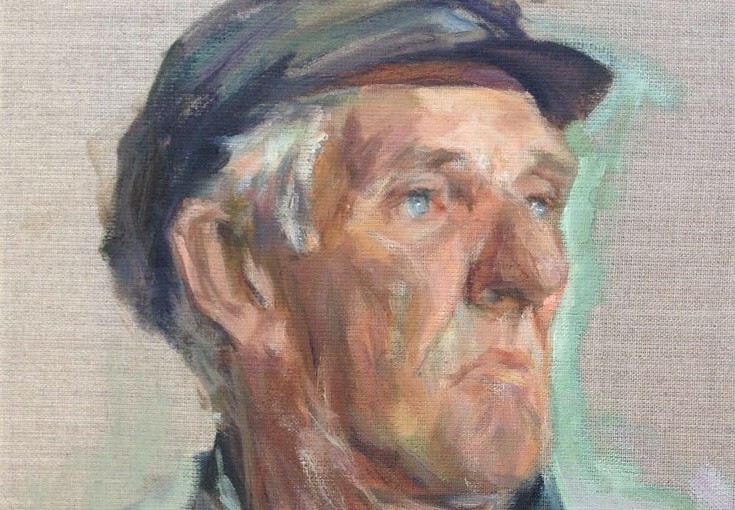 Then taking my details, after my son in law reminded him to look at my driving licence, he placed the last one on the passenger’s lap and we drove the remaining fifty yards to our destination. That night we decided to call it quits and not risk another load just in case word got out that we had no permission to loan the cones! The following morning found me in town to supervise the placing of the traffic cones with the traffic warden. He informed me that they, the force, were short of the required number and any we could muster ourselves would be very helpful. Telling him of last night’s caper he told me to go and get the rest. In daylight it was easy stacking them in order. The remaining ones fitted easy so the procession route was ready. The lads had been busy and the fireworks were ready in record time owing to the dry conditions. The drums around the course were placed in position and filled with water to quench the spent torches. The Landgate Tower had been primed with hundreds of large noisy bangers, to be fired as the celebrity was chaired down to light the fire. All was in order, now we waited the hour to start. One thousand programmes had sold well and eventually there were none left. Everyone took their place; radios were issued to all the marshals at the police briefing beforehand and then we were ready. What could go wrong? We, the Bonfire Society, had done this so often. 2004 had seen many changes. No noise from fireworks in the streets now and we had to keep each bang down to a certain decibel, equivalent to a car door slamming shut. There were to be no letting fireworks off in the street. How tame! Still, this year we had one of the largest parades Rye had ever seen. The first hint that the police, who insisted on everything running like clockwork, showed a flaw was as the leaders approached the level crossing. The two leading motorcyclists dithered as a train was coming from Hastings, halting the procession as the barriers descended. They then made to lead off as they rose. I fortunately was at the head collecting and foresaw the catastrophe that was to follow if they moved. Against their insistence that the gates were to close only once for a train, and that had now happened they were unaware the track was single and the Ashford train was in the station awaiting the other to pass, then he would leave and the barriers would close again. The police were adamant that the barrier would only close once; they had it in writing. Sod their theory! There was a train in the station, Hastings bound, showing two white headlights. Luckily our safety marshal was up front on his trusty push bike and one glance from him told him to hold the parade for a few more minutes. The barrier closed once more, the train passed and we were off again the leading police going the wrong way, they soon say the error of there written plan and had to barge their way forward through the marchers to regain the head, why don’t they listen to the ones who could do it blind folded backwards. The first few floats passed under the Tower Gate; the fifth ran into difficulties with a diesel air lock and ground to a halt effectively blocking any passage, even for the walking. The tractor had made itself clear before entering the arch that it was getting starved of fuel and many people that heard the engine hunting for fuel knew the results, which would follow. The stupid lad driving should never have tried to go any further, instead stopping and allowing the parade to pass him. Now he ruined the whole evening. From the tower up and along the ancient High Street, three and a half thousand people jostled for position to view the spectacle, which was to pass before them. The tractor now prevented that and the police panicked, reasoning that to stop the thousand torch bearing society members for ten minutes would incite the crowd to charge forward to view the grand parade were they could see. Instead the police directed them on to the Salts and fire site to stand around for half an hour with blazing torches while the news slowly spread around the high street and allowed the crowd to flow down to the salts. The fact that not one of them tried to fire the pile of pallets ready primed with fuel surely shows that the riotous crowd the police were so worried over were not like that. Instead they stood awaiting the celebrity to torch the fire as planned. “Well done you lot. I take my hat off to you all!” The crowds of people that were disappointed in not witnessing the spectacular procession made their way down onto the Salts and crowded the area. 2004 saw the largest herd of humanity Rye has ever had at a bonfire, and that the collection of pennies was sorely down on other years shows the disappointment of the crowds that missed the show. The night was not finished for half way through the display of fireworks, some idiot of a policeman let a car through the closed road as the driver had told him his wife was having her baby and he had to get to Hastings Hospital. The car came face to face with the local fire engine and two thousand static people so he was going nowhere in a hurry. The woman’s waters had broken and she insisted that she was going to have the baby in the back of the car and not in an ambulance that stood ten feet away. As a cordon of police surrounded the car, the woman relented and took her place in the ambulance that did not try to move. Then a young girl with a fellow passenger and two kids in the back came out of the Bedford car park and tried to drive to Camber, to be met by the crowd going home in front. The driver was harassing one of our woman collectors nudging her in the back of her legs to get her to move. The chap who was the passenger tried to get out to sort a lad out who had said something to him that he took offence to and I had to tell the woman driver to turn her engine off before someone got hurt! The celebrity was not chaired down as usual, instead having to walk as the arch was blocked by the bloody great four wheel drive tractor, so the fireworks packed in the top of Landgate Tower among all the pigeon droppings were never let off and had to be removed the following day. The crowds left for home and the Society got to work clearing up the town. I collected all the borrowed traffic cones and delivered them back in neat piles. 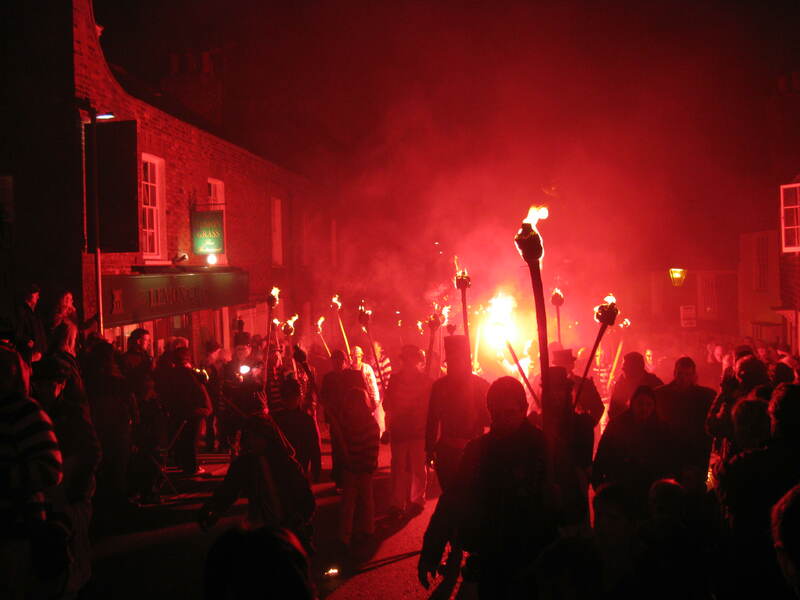 The torch boys emptied the water drums and cleared the spent torches up the usual men, swept the streets and next dawn the fire was raked over into a glowing mass of ash. The town awoke to a pristine Remembrance Day.